Typhoon Nesat killed three people, washed away homes and flooded highways in southern China’s Guangxi region as authorities readied for a second storm approaching the area. Nesat destroyed 2,200 homes, damaged 6,100 others and rendered 3,620 hectares of cropland “useless,” the official Xinhua News Agency cited local authorities as saying yesterday. Xinhua cited one villager in Guangxi’s Pubei County as saying all of his sugarcane crop had been broken by the winds. Typhoon Nalgae, packing maximum sustained winds of 119 kilometers (74 miles) per hour, is heading toward the Paracel islands near China’s Hainan province and the Vietnam coast at 10-15 kilometers per hour, the website of China’s meteorological service reported as of 5 a.m. Beijing time. Disaster authorities in the Philippines issued their strongest storm warning for 10 provinces as Nalgae struck the main island of Luzon yesterday, four days after Nesat caused at least 50 deaths and $137 million in damage to crops and infrastructure in the island nation. 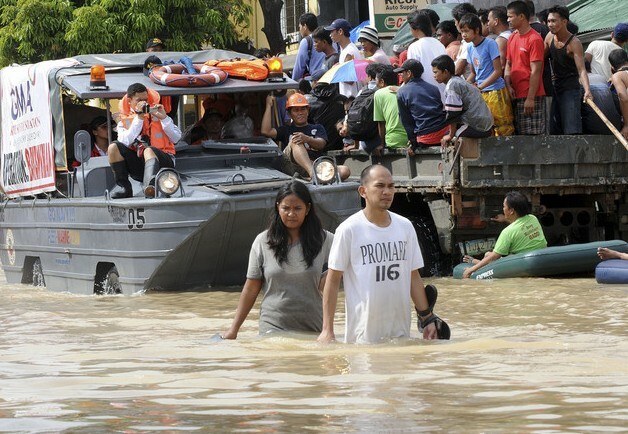 Downpours were forecast in Metro Manila, and some rice- growing districts were still flooded from Nesat’s rains, said Graciano Yumul at Pagasa, the state weather bureau. Maximum rainfall from Nesat in the provincial capital of Nanning, as well as Beihai, Qinzhou and Fangchenggang, totaled 400 millimeters (15.7 inches), Xinhua said. Nesat was downgraded to a tropical storm on Sept. 30. As it swept past Hong Kong Sept. 29, Nesat felled trees, ripped bamboo scaffolding from buildings and forced the city’s stock exchange to shut. It slammed into the Chinese island province of Hainan with typhoon winds of 151 kilometers per hour, forcing the evacuation of 450,000 people and causing 5.8 billion yuan ($909 million) of damage, Xinhua said. It then moved on to northern Vietnam. Nesat was the strongest typhoon to hit China this year and the most powerful to strike Hainan province in six years, according to the Chinese weather agency. Authorities in Hainan ordered ships back to port, canceled ferry services and halted flights and high-speed rail services Sept. 29 ahead of the storm’s arrival.